Bona re-emerges this August as Philippine Educational Theater Association (PETA) opens its 45th theater season in retrospect of a film classic that once captivated the hearts of Filipino audiences. 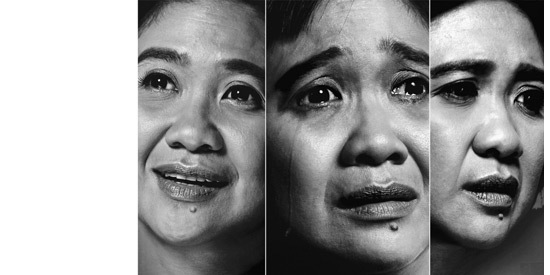 Originally directed by National Artist for Film and one of PETA's founding members Lino Brocka, the film Bona is about a young schoolgirl, played by Nora Aunor, who became a die-hard fan of Gardo, a wannabe actor essayed by Philip Salvador. Set in contemporary Manila, PETA's stage adaptation of Bona revolves around Eugene Domingo as a spinster call center agent who becomes a fan of Gino Sanchez (Edgar Allan Guzman), a contestant in the talent search 'Star of Tomorrow'. Blinded by her obsession on Gino, Bona turns her back on everything she values and gives up nearly everything she has. Caught in a quicksand of worship and pity, Bona proves how obsession may overpower love and even lead to a person's demise. Bona will run from August 24 to September 23, 2012 at The PETA Theater Center, No.5 Eymard Drive, New Manila, Quezon City. For more information, contact Tel. No. 725-6244 or 0917-5765400.